Exploring Immersive Technology - Much of the current excitement around augmented reality and virtual reality is centered around gaming, but these technologies will have a larger, lasting impact on the L&D. A 2018 Capterra survey on top tech trends found as many as 46% of U.S. small and medium-sized businesses are looking into leveraging VR in the next two years. Virtual and augmented reality are becoming more accessible each year. These emerging technologies have the greatest potential to help manage change in an organization. Designing Training for Sustainment and Retention - All instruction, especially skills-based training, requires validation and reinforcement. Whether custom-designed or off-the-shelf, the impact of your training will be minimal if your organization doesn’t have a plan for application and reflection in the field after the training is complete. Effective training is not a “one and done” event. Smart companies recognize the real change happens when the team walks into the field with their new learning in hand and starts putting it into practice. These companies design training with the longer view of change in mind. The goal of refresher training is to sustain learning, increase knowledge retention, and fight the forgetting curve. People forget 50% of what they learn in 1 hour. 70% within 24 hours. And 90% within a week. Making Learning More Accessible - L&D needs to provide access to training “anytime, anywhere, on any device.” as our roles become more complex and the way we work more dynamic. Pull up a simulation on your phone and review, in a lull between meetings, jump on your computer and work through an interactive learning guide, these are the facilitation L&D needs to work on. Micro-learning and accessible learning go hand in hand. The process of repackaging training for agility also sets you up for quicker, more efficient development of training. Embracing Artificial Intelligence - Emerging technologies like Artificial Intelligence and Machine Learning can have a significant impact on how learning is consumed in 2019. The two ways in which it can enhance learning experience is through measuring effectiveness and achieving personalization. IBM recently noted by applying AI to a workplace, “employees can receive more personalized recommendations to facilitate evergreen, curated learning paths and anticipatory career management.”, which on the other hand can help employers to offer career pathing to employees, highly personalized training programs and enhanced onsite job training. From Netflix to Amazon to Facebook, AI has permeated our daily lives to deliver personalized recommendation each time we visit these sites. Imagine the effect of this smart curation can have in your learning environment; it can lead to a more timely and engaging experience for employees. Another significant way in which AI can aid you is in measuring effectiveness. Technologies such as Face recognition, for example, can be used in training, simulation, and role-playing to measure how each employee is applying new learning. Based on this assessment, learners can then be directed back to the LMS where they can receive custom follow up training. Companies embracing automation need to work closely with L&D to teach employees how to work alongside these new tools. As work becomes more creative and objective, the role of L&D will shift along with our teams in response to automation. L&D must ensure workplace training is designed and delivered for more complex work. What an amazing opportunity for Instructional Designers and Trainers. Using Mindfulness at Workplace - A study conducted by Wrike found 94% of the workers surveyed reported that their stress level is “high to unsustainably high,” which further impacts their health and workplace productivity. Today, many companies have already taken cognizance of this and started investing in Mindfulness programs for their employees with a view to reducing burnout and subsequent turnover. The same report predicts how Mindfulness and meditation are set to become a $2.08 billion industry with an annual growth rate of 11.4 percent by 2022. The report also cites the examples of McKinsey, Adobe, Nike, P&G, Google, Intel, General Mills and Apple who have successfully implemented Mindfulness programs for their employees. Prioritization of Soft Skills - With organizations becoming more global, employers are realizing how critical it is to develop an employee’s soft skills such as collaboration, negotiation, and emotional intelligence. In fact, soft skills are known to boost an organization’s work culture, increase the retention rate and improve leadership. Competency research carried out globally in over 200 organizations found that EQ was twice as critical as cognitive and technical ability in distinguishing best performers from average ones. When it comes to senior leadership roles, it was found to be four times as important. A study of over 500 executives revealed EQ as a better predictor of success as compared to IQ or relevant previous experience. Leverage Training As an Employee Incentive - According to a Middlesex University study cited in a recent Sh!ft infographic, of almost 4,300 workers polled, a whopping 74% felt that they weren’t achieving their full potential at work. So how does a business engage its employees to make them feel empowered and more productive? One answer is by providing the right learning and development opportunities with making it learner centric. Making your learning and development program learner-centric is one thing, but getting them to view training as an opportunity for growth and investment for knowledge and skills honing is another. L&D programs have become a key differentiator between companies competing for talent. It also plays an active role in engaging, motivating, retaining and empowering your best talent; decreasing employee turnover and unproductivity. Design Thinking - Design thinking draws upon logic, imagination, intuition, and systemic reasoning, to explore possibilities of what could be—and to create desired outcomes that benefit the end user. It places a great value on empathy for your users. The practice of Design Thinking seems to be sorely missing from instructional design university programs, professional training and workplace practices. Design Thinking has the potential to help us come up with better design solutions that get the interest and attention of a learner. As Tim Brown (the CEO of IDEO) beautifully puts “Design thinking is a human-centered approach to innovation that draws from the designer’s toolkit to integrate the needs of people, the possibilities of technology, and the requirements for business success.” So, infusing your programmes with a design-driven culture that understands the learners first may not only provide real and measurable results but also give you a distinct competitive advantage. Weigh Learner-Centric Against Content-Oriented Training - Training in the past that focused solely on content was “one size fits all,” which made it difficult to engage with the learner. Today, we must zero in on the learner, including his or her experience, work environment, performance and technological fluency, to create a training program. Any effective training program is one developed for the individual and offers social activities to share their experiences. As you train, think of your employees as consumers. They are used to getting 500,000 results per search on Google, YouTube automatically playing related videos based on what they’ve just watched, and Netflix suggesting content matches based on viewing pattern algorithms. For the learning consumer, training clips on your YouTube channel, a classroom training session, a MOOC (massive online open course) or a post shared on Facebook Workplace are elements that can be turned into learning content. Adaptive Learning - We’ve been doing it for years before the term “adaptive learning” got coined. Everyone wants something that’s custom for themselves. If it’s unique—special for me—it’s seen as more valuable than things that are mass-produced where everyone gets the same thing. In the past, identifying a performance gap happening in a given role meant everyone got trained; today, there’s more focus on training and upskilling according to individual needs. It’s actually more efficient to train people only on the things they need, rather than on everything. Additionally, advances in technology make assessing individual learners’ prior knowledge and competencies easier, as well as giving them access to the learning they want and need. Artificial Intelligence built into learning systems (LMSs, LXPs) can serve up personalized recommendations for learning experiences and intelligent learning paths. Learning Artifacts - For something completely different, let’s talk about artifacts. Culture guru, Edgar Schein, wrote about artifacts back in the ‘80s: tangible things that, when we see them, help connect us to our workplace culture. Learning artifacts are a twist on this concept: could something that learners create during the learning experience, either by themselves or with a team, resulting in a tangible object that serves to remind them of that experience? That object then becomes a stand-in for or embodiment of the learning experience. Here’s an example: in a course designed for Engineers, a gamification element was added, in that each time they finished a lesson, they “unlocked” part of the instructions to build a Star Wars X-Wing Fighter out of office supplies. They LOVED this—took pictures, posted them on the social learning platform, and every post got great reactions and comments. And it’s imbued with an association to what they learned, every time they see it. 1. Mental Health Talks - Fostering a comfortable and safe environment for all employees where one can freely share & express his / her views about organizational culture and suggest ideas to make the workplace better. 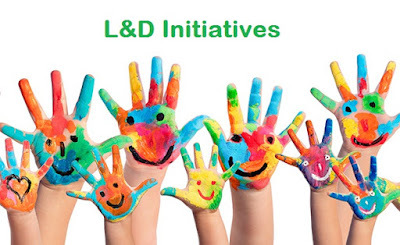 The L&D can take a note and plan necessary interventions accordingly. 2. Lunch and Learns - Foster a culture where Lunch and Learns are the norm. These should be casual meetings over lunch, facilitated by a different person every session, and built around a topic that person specializes in and wants to broadcast. It could be discussing a new book they've read, a new tactic, a new craft in their field or a new approach. 3. Communication Gym - is an L&D initiative where employees learn, practice, and master life-changing communication skills. It can provide a platform to employees to share their knowledge, speak on topic of their interest and learn from each other. 4. Self-Directed Programs - Self-directed/paced programs (with formalized objectives and content) effectively provide low-cost development and ongoing learning. 5. Research Project "Bake-Offs" - Construct special projects for select cohorts as development opportunities, closing with presentations. 6. Mentoring Programs - A low-cost training initiative organizations can make use of for new employees or ongoing staff learning is a mentoring program. A mentoring program can help new employees learn more quickly about an organization and how to meet the expectations of their job. 7. Auditing and Measuring - Auditing and measuring are key features when implementing any training initiative. By seeing results, everyone understands the programs better. For example, once a new hire completes his/her onboarding sessions, test the knowledge to ensure critical information was shared & understood. 8. Training Process Gamification - Turning elements of a training process into a game or challenge can serve as a fun, memorable way to educate employees and allow them to better retain information. 9.Inside Training With Top Performers - Training does not have to cost you a tremendous amount of money, if you look inside your organization. Your leaders and top performers can hold many soft skill and technical training classes, as well as mentor and coach junior level employees. 10. Online Training and Team Discussions - Utilizing a social media app/ page for relevant online training / learning information along with follow-up discussions in team meetings can accelerate the path to productivity for new employees. 11. Training Videos Archive - Most companies hold regular meetings with their management-level personnel, and inevitably there are segments of training. By having these seminars recorded, your company can have new managers watch these videos and get up to speed much faster. 12. Do-It-Yourself Development Plans - Hold sessions to assist employees in making their own development plans. These should include their personal mission statements, their short-term and long-term career goals, their current skills gaps and plans to close these gaps. 13. Apprenticeships and Cross Training - Never underestimate the power of apprenticeships (internal mentor programs) and cross training. Apprenticeships give employees and managers the chance to intern within the organization, working with leaders or other departments on projects and/or development. 14. Social Learning- One of the best low-cost and easy-to-implement training solutions is social learning, where one employee can shadow a more experienced team member to better understand his/her role, day-to-day responsibilities and processes. Benefits include real-time and direct feedback, knowledge transfer and catering to individual learning preferences. Social learning fosters a collaborative organizational culture. 15. A Mentoring Program - Mentoring, when done right, is a network intervention that requires the least capital expenditure and can provide positive impact in a variety of areas such as onboarding, learning, employee engagement and retention. The challenge is that simply launching a mentor program is not sufficient. It requires nuanced planning and consideration of mentor-mentee alignment, adoption and culture change. 16. Study Circle - The concept of Study Circle aims at self-development of employees by instilling a desire to acquire/update knowledge, information and experience. It also kindles and triggers thinking and learning process, thus facilitating personality development. Dr. Ajit is an author, motivator, speaker & trainer by profession. He is an MBA-HR, PTHE and CTE & has more than a decade of experience in industry and academics i.e. in HRD, Training & Consultancy. He is honoured with Honorary Ph.D (Doctorem Honoris Causa) from FTU, California, completed NLP Foundation Diploma course under NLPh, USA and is also Certified NLP Practitioner from NLP Goa. He also has attended DISC profiling session organized by The MindMasters & completed courses on HRM & Effective conversation from “Fair & Lovely Learning Foundation”. Dr. Ajit also completed Lean Six Sigma Yellow Belt E-Training from “Go Lean Six Sigma”. He is awarded with NAA Foundation Excellence Award-2016 for outstanding contribution in the field of L&D and received “Out Standing Trainer Award” from JCI in 2014. He is a member of ecch-U.K, ISTD, NHRD, Harvard Business Publishing for Educators, Human Capital Institute – New York, etc. He received his special training on CRM & ELT (English Language Teaching) at Macmillan, IFLD, Train Now & Akiko CallNet-USA & XIMB etc. He has completed STC in HRM at IIT (Kharagpur).